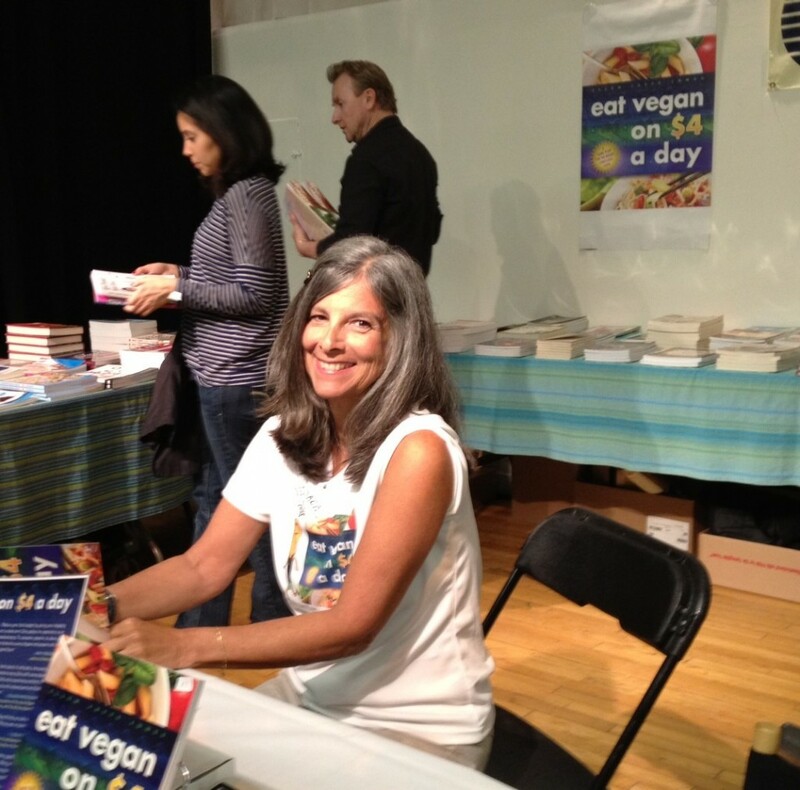 Photo: Ellen Jaffe Jones, the author of Eat Vegan on $4 a Day. It was wild, it was crazy, it was the 2nd annual NYC Vegetarian Food Festival! With new products galore, the event was another smash hit. There were lots of great foods to sample and explore! We saw new products like Sunsational non-dairy milk made from sunflower seeds, and we tasted super yummy sacha inchi seeds from Sacha Vida, omega rich seeds from the Peruvian Amazon Forest. We also got to visit with some of our old favorites like Teese Cheese and Earth Balance. The speakers were diverse and inspiring. Among them were Ellen Jaffe Jones, author of Eat Vegan on $4 a Day, and Brendan Brazier author of Thrive: The Vegan Nutrition Guide to Optimum Performance in Sports and Life, who reminded us that we can be overfed but undernourished. Innovation abounds! We saw so many more vegan products. We sampled new cookies, new protein drinks, new raw foods and dried fruits, new drinks… and this is a marker of how much consumer tastes and preferences really are changing. Yay! It’s such an exciting time to explore a plant-based life. The crowd was really excited to be there! People were smiling, happy, and energized. It was a pleasure to see young people, older people, and heck – just so MANY people at the event. Eat more plants was the message of the day. A diet rich in whole, plant-based foods offers health benefits like quicker recovery after workouts, better sleep, and an easy way to reach and maintain an ideal weight. As we head home to Pittsburgh, we’ll remember this year’s event fondly. Nira Paliwoda and Sarah Gross did fabulous job as the event organizers. It was a thrill to be a part of it and to share the Yummy Plants© 101: Easy Transition Tips for a Vegan Diet. We want to thank everyone who came to Rebecca’s presentation, and we hope to see everyone again next year!